ULTRA Japan has delivered the first installment of their 2018 lineup ahead of the festival’s 5th anniversary. Featuring internationally renowned electronic music talent from every corner of the world, ULTRA Japan makes its’ highly anticipated return to Tokyo Odaiba ULTRA Park across 3 days and multiple stages this autumn, September 15, 16 & 17, 2018. A high class assortment of mainstage acts has been announced alongside those representing the underground sounds of RESISTANCE, directing the attention of fans from every facet of electronic music towards Tokyo this September. 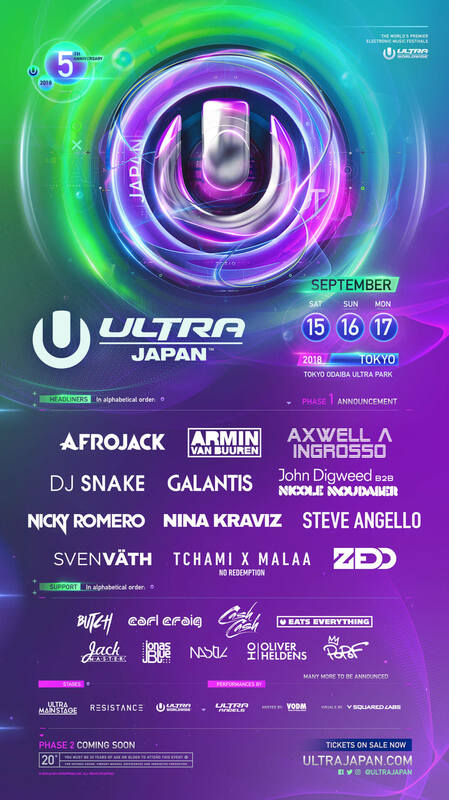 Following 2017’s memorable event, Japan’s 5th edition of the globetrotting electronic music experience has confirmed performances from ULTRA staples Afrojack, Armin van Buuren, Axwell Λ Ingrosso, DJ Snake, Galantis, Nicky Romero, Steve Angello, Tchami x Malaa and Zedd. Fortifying what is already an undeniably strong, balanced lineup, Cash Cash, Jonas Blue and Oliver Heldens will add additional variety to the confirmed mainstage acts. RESISTANCE returns to Tokyo this September in full swing with John Digweed & Nicole Moudaber scheduled to play B2B for the first time ever, alongside headlining performances from techno royalty Nina Kraviz and Ibiza legend Sven Väth. Reinforcing what is already an undeniably strong, balanced assortment of underground talent Carl Craig, Jackmaster, Nastia and Popof join the RESISTANCE camp this September. With over 120,000 people attending last year’s incredible sold out 2017 edition, the 5th anniversary of ULTRA Japan is ready to amaze once again. Fans are advised to get their tickets early as demand is among the highest of all ULTRA Worldwide festivals.